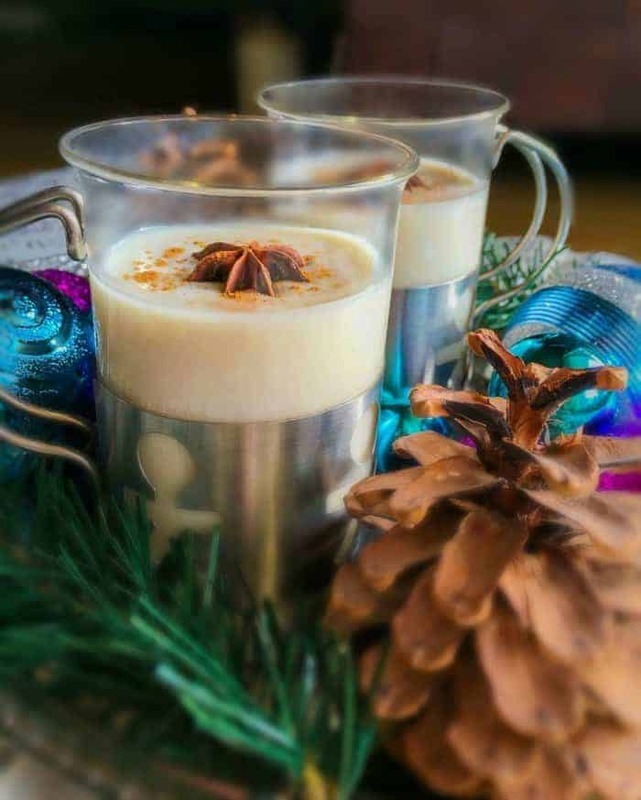 Spiced Spiked Eggnog (Homemade Eggnog Recipe using Rum) is a flavorful cosy-warm drink that’s perfect for Holiday celebrations. It’s filled with aromatic flavours that are sure to please anyone and everyone. 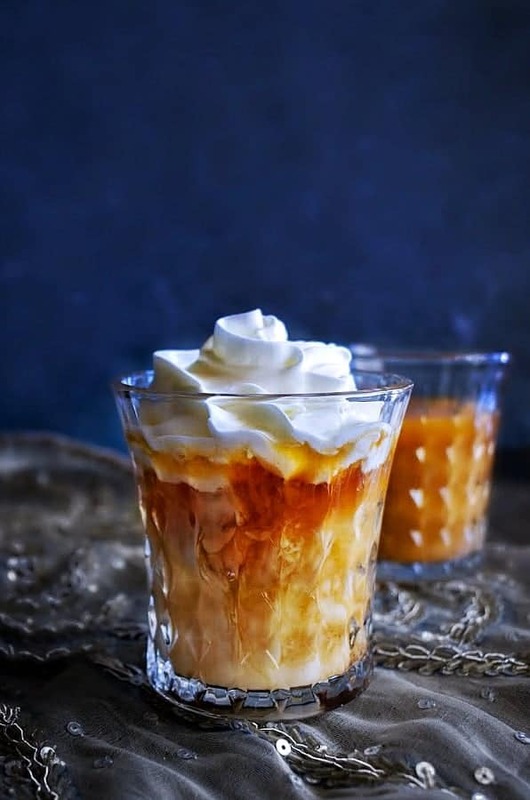 Till date, I’ve had many versions of it but I love the spiced version of Eggnog the best (you gotta try this Spiced Spiked Eggnog recipe to find out WHY). There’s something really magical the way the spiced-rum (in this recipe) other ingredients mix to give this rich, flavorful taste. Of Course, you can still be delighted by having the original more traditional version, but give this one a try – I PROMISE, you won’t be disappointed. I started making this Spiced Spiked Eggnog version almost 6 yrs ago and haven’t changed anything in the recipe since then. It’s so simple and your kitchen actually smells divine. The slow cooking or I could say the mixing of milk with spices releases this very Holiday-ish smell. The spices which we are using is mild and mix amazingly with each other. If you want, you can make a dry mixture after roasting these spices and just use it next time to make any of your holiday treats. As that tastes amazing with this combination. I guess, its the nut milk that enhances and mixed well with the spices. 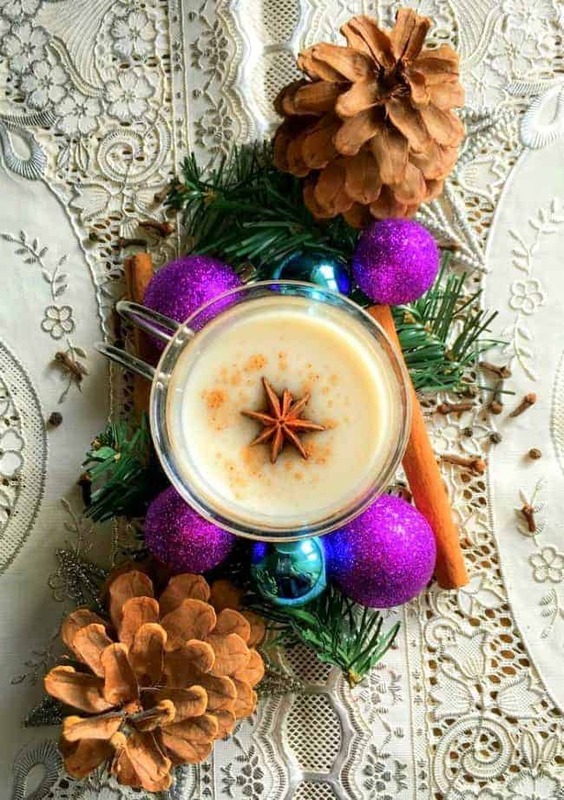 So, I’m making a HUGE batch of this eggnog to enjoy with friends & family this holiday. This particular recipe needs to be consumed on the day it’s made. 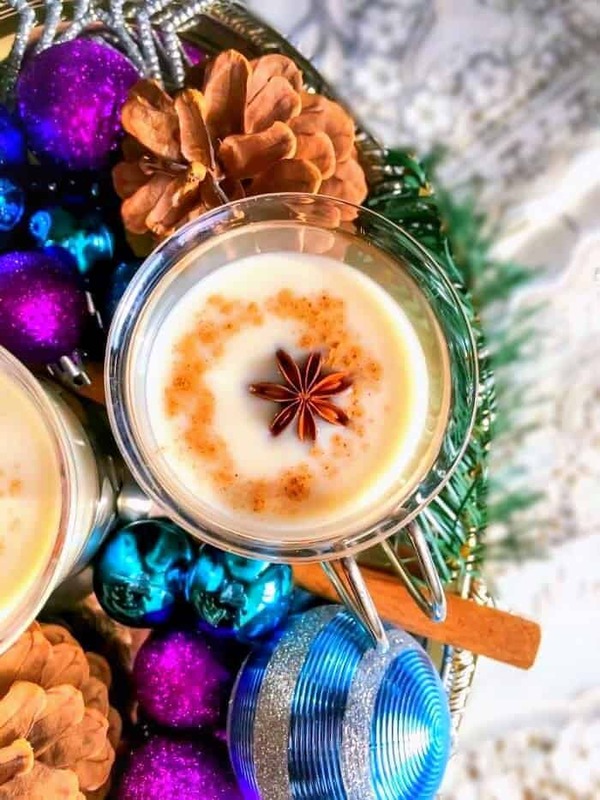 Spiced Spiked Eggnog (Homemade Eggnog Recipe) is a flavorful cozy-warm drink that's perfect for Holiday celebrations. You can make it Vegan too. In a saucepan, heat milk along with all the spices, after the first boil, reduce the heat to low and cook for 6 minutes (stirring every 2 minutes). Now add vanilla essence, bring to a boil and turn off the heat. Strain the content the milk mixture. In a blender, add eggs, rum, sugar, milk mixture and pulse to form a smooth mix. Now add cream and pulse one last time. Transfer to serving glasses, sprinkle with some powdered cinnamon and serve fresh. 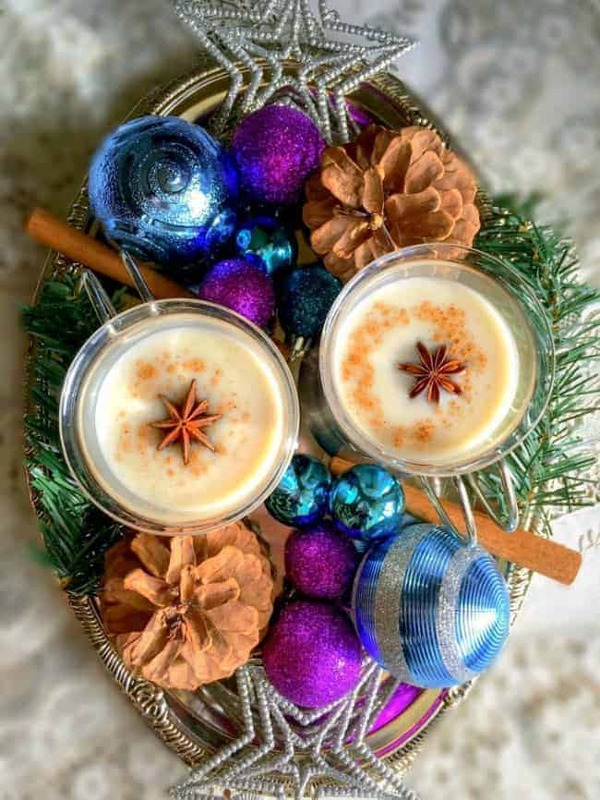 26 Replies to "Spiced Spiked Eggnog (Homemade Eggnog Recipe using Rum)"
Can you make this without the Star anise? I’ve never made eggnog before, alcoholic or non, this looks tasty! That looks so awesome – love the presentation! Looks wonderful! I love eggnog! Love the use of spices in this! sounds delicious. I’ve always wanted to try making my own egg nog! What a great holiday drink! Okay, so thank you SOOO much for this post. My hubby absolutely loves eggnog like you wouldn’t believe. And i’ve never heard of it being spiced!!!! I’m totally making this for him! That would be Awesome, Definitely give it a try. The spices are really light, so goes great with Eggnog – Thanks for visiting. I love egg nog — and then if you spike it?? Well, that will make me extra happy 🙂 Since I’m the only one who likes it in my family I think I’ll just whip up a batch to enjoy in the evenings in front of the fire YUM!! Thank you for the inspiration!! I’m so glad, you liked the recipe. It’s actually perfect to be consumed quickly and you just just half the recipe to make a small batch 🙂 Thanks for visiting. Lolz, Definitely give them a try – they are truely Yummm!! !